This article is about the Cirque du Soleil production. For other uses, see Alegria (disambiguation). It was one of Cirque du Soleil's most popular touring shows. Since it premiered in April 1994, it has been performed over 5,000 times and seen by over 14 million spectators in more than 250 cities around the world. Alegría originated as a touring big top show. However, beginning with its 2009-2011 North American tour, the show was converted to an arena format, enabling it to visit cities that were previously inaccessible to the big top tour. Furthermore, Alegría took a short respite and was converted to a resident show at MGM's Beau Rivage casino from May 1999 to October 2000 before it continued touring again. On 29 December 2013, Alegría performed its final show at the Lotto Arena in Antwerp, Belgium. Alegría takes its name from the Spanish word for "joy." Cirque du Soleil's literature describes the show as "an operatic introspection of the struggle for power and the invigorating energy of youth." Dominique Lemieux's costumes evince a baroque aesthetic of decadence and ornamentation, while René Dupéré's musical score features a unique blend of French, Spanish, African, and Mediterranean influences. The stage and props are characterized by gothic arches and harsh angular designs. In 2019, beloved by fans from around the world, the iconic Alegría is reinterpreted in a revamped version to share its timeless story once again. "ALEGRIA in a new light", has its launch of 18 of April of 2019, in Montreal, Quebec. Alegria's Grand Chapiteau in São Paulo, Brazil. March 2008. The stage of Alegría is topped by a giant dome and decorated with stylistic columns and balustrades. The dome gives the sense of an impressive, powerful structure, similar to how churches and government buildings utilize similar architectural constructs. The stage has spiral ramps on opposing sides which lead down, symbolizing the unknown. The floor of the stage has the head of a salamander, used for the four elements in which it lives. The 17th-century-ballroom stylistic lighting design reflects a nostalgic atmosphere. Finally, an autumnal color palette creates the luminous obscurity of the show. The characters in Alegría comprise people of two separate generations: the New Order and the Old Order. Fleur: An unpredictable and dangerous madman who believes he is king. He is the guide to the world of Alegría. Nostalgic old birds: The Nostalgic Old Birds have lived in the palace for as long as it has existed. They are empty-shelled courtiers who admire their reflections in mirror-less frames. Just to name a few of them, there is Gracieuse, Blanche, Valentin, Wilfrid, Georges-Etienne, Big Bird and more! Fire Bird: He appears for a little dance right before Fire Knife act and is present in the background and on the top of the some while the fire knife dancer is performing. Tamir and Little Tamir: Appears when needed, only to disappear once he has fulfilled his mission. The Musicians: For our delight, they start the show. A symphony in white. Nymphs: Exuberant characters who celebrate life. Bronx: The young and tough, who are the next generation in Alegría. They perform power track and aerial high bar. The Angels: The guardians who are the youth of tomorrow. They perform Russian bars. White singer: One of the singers. She is the storyteller who sings about everything she sees around her. She is often desired by the male characters of the show. Black singer: One of the singers. She has a wickedness about her and is the White singer's opposite. She always avoids approaching the front of the stage. Clowns: The show's social commentators. The acts of Alegría have had a bit of turnover, but continue to fit its theme: "A baroque ode to the energy, grace and power of youth." Opening: Fleur and the musicians, walk in the audience, while the show is being prepared. Prologue (Mirko): The white singer sings a song while the characters and acrobats of Alegría run around the stage to welcome the audience to the world of Alegría. Synchronized trapeze: Two acrobats perform tricks on two separate trapezes. Horse: A clown and a horse have comical problems. Power track: A group of acrobats perform flips and twists on an X-shaped power track. Paper planes: The clowns come in, playing with paper airplanes. Hand balancing: An artist performs handbalancing on canes. Fire-knife dance: Two artists perform a dance using fire-knives. Clown candle: A clown comes in, and tries to mimic the fire-knife dancing act by using a candle instead. Manipulation: An artist manipulates ribbons, contortion and hula hoops. The original act consisted of only contortion, and hula hoops. Snowstorm: Reflecting the eternal spirit of mankind, the clowns are witnesses to the passing of centuries, the social commentators of the world of Alegría. Grounded in real life, they tell little stories of everyday existence where everyone is a hero, and where anyone can fall in love and suffer a broken heart. The clowns are visionaries - philosophers of absurdity. Endearing, comical and childlike, they turn the world into a circus. Le Bal: The white singer comes in and sings Danze Vazoule while going in the audience, picking a person out and dancing with the audience member. Flying man: An artist bounces and flies high above the stage with bungee cords. The Bar: The clowns come in and play with a Russian bar. Russian bars: A group of acrobats perform Russian bars. Contortion: Two artists create graceful and lithe figures and movements with their extreme flexibility and balance. The original act consisted of one contortionist. Interlude to Aerial high bar: Little tamir comes and flies with a bird structure. Aerial high bar: A group of acrobats fly, twist and spin on a structure in the air while a net is below them. Once they fly off the structure, the acrobats will be caught by other acrobats on a swinging trapeze. Finale: The white singer sings Alegría while the cast of Alegría comes and says farewell to the audience. Cyr wheel: An artist spins and performs tricks in a Cyr wheel. Juggling: An artist juggled up to 6 balls. Tightwire: A performer balanced precariously on a wire, the performer would jump and even flip on the wire. Shoulder pole wire: An original Alegría act, it featured a young performer who balanced a long pole on their shoulders with a tight wire platform on top. On this wire, a younger performer flipped, turned and leapt always keeping their balance. Strong man: This act was quite literally a very strong man, the performer would warp metal and even lift the weight of multiple performers. Slackwire: This act used a swinging, loose wire. On this a female artist balanced, rolled and even rode a unicycle on the slack wire. Aerial cube: An artist performed with the metal skeleton of a large cube on the ground and in the air. Aerial silk: Strong yet sensitive, powerful yet delicate, natural but surreal, the Flying Man emerges from the shadows, showing his force for more subtle art, evoking sensual men's movement, and the live stream on silk. Solo trapeze: An acrobat performed on a single trapeze. Fast track: Acrobats tumbled, flipped and spun on this fast-paced act. The Big Mess: One of the clowns accidentally pops a balloon, so he brings the other two clowns out to see if they could help out, but the entire situation spirals out of control when they start throwing paper, garbage bags, confetti, and gigantic balloons all over the stage. Flowers: One of the clowns tries to ask someone out with a bouquet of flowers, but gets interrupted by the other clowns. when his date refuses, he becomes saddened. but the other clowns give him flowers of their own, and afterwards they dance off the stage. Birds on a wire: Two of the clowns pretend to be birds pirched on a long wire in this comedic tale about friendship and folly. Martyr: One of the original clown act at the beginning of the show. A clown dies comically, pierced by a myriad of arrows. Balloon: The clowns are concerned with the struggles between two individuals. Rain: Involves a lonely clown as he makes his way through the rain to find the sun. Plane: One of the clowns does tricks with a toy airplane on a string attached to his hair. Running Man: Two of the clowns are attacked by a strange running man. The Shadow: Two of the clowns have a strange encounter with one another. Noose: One of the clowns finds a strap from the aerial strap act and tells the other two to come onto the stage, the two walk into the stage carrying a rope, while the one clown directs them to avoid the strap. Afterwards it's revealed that the clowns were carrying a noose, and they try to put it on they're necks much to the objection of the one clown. They try to do it to the audience but are yelled off by the other clown. Alegría's costumes have a dichotomy relating to the Old Order and the New Order. The Old Order has costumes which are reminiscent of New York's Gilded Age as they are finely decorated with feathers, lace, and other adornments. The New Order, on the other hand, representing the youth of tomorrow, have the same rich hues as the old order, while the fabrics used are lighter and softer, helping to emphasize the agility of youth. Over 400 costume pieces comprise the Alegría wardrobe set, including shoes, wigs, hats, etc. As an example of how long it takes to create each custom outfit, over 200 hours are needed to create one Old Bird costume. Fleur: Part of the Old Order, Fleur is easily recognizable in his red velvet jacket and jeweled vest. Singer in White: Part of the Old Order, the Singer in White has a bejeweled crinoline skirt. She also is adorned with a pearl necklace and matching bracelets with rings attached. The original album artwork of Alegría, 1994. Alegría’s highly acclaimed music was composed by René Dupéré, who had composed numerous scores for Cirque's previous productions, including Nouvelle Expérience, Saltimbanco and Mystère. The music of Alegría was released as a studio album on September 27, 1994. Produced by Robbi Finkel, it remains Cirque du Soleil's best-selling album to date, having sold more than 500,000 copies worldwide. Robbi Finkel and René Dupéré were nominated for a Grammy Award as Best Arranger at the 38th Annual Grammy Awards. The album was also nominated for several Félix Awards in 1995, winning two of the latter: 'Producer of the Year' for Robbi Finkel and René Dupéré, and 'Sound Mixer of the Year' for Rob Heaney. Alegría was also ranked on the Billboard World Music Chart for 65 weeks. The album's lead vocals are provided by opera-trained, French-Canadian singer Francesca Gagnon. Gagnon also features as 'The White Singer' (principal vocalist) in the Alegría DVD, with fellow French-Canadian Ève Montpetit supporting as 'The Black Singer'. Several versions of the soundtrack have been available since its original release. In 2002, the soundtrack was re-released by Cirque du Soleil Musique Inc., with an additional two tracks titled 'Cerceaux' and 'Malioumba' (both featuring vocals by Francesca Gagnon) recorded from live shows during Alegría’s 2001 season in Sydney. In 1995, a limited employee edition, Alegría - Live at Fairfax, was created for the artists and crew of the production. This special edition features the entire score on CD and is considered a collector's item. The tracks for the original 1994 release, including the two extended tracks from 2002 are listed below and alongside are the acts during which they are played. In 1999, Alegría was adapted into a film of the same name, written by Rudy Barichello and directed by Franco Dragone. The cast included actors such as Frank Langella, Mako, Julie Cox, René Bazinet and a guest appearance from Whoopi Goldberg, as well as several performers and musicians from the touring production (many appeared in both this film and the Alegría DVD). The film employs a conventional structured narrative as opposed to the abstract allegory of the live show. It tells the story of a boy named Momo who wants to save the children from their imprisonment in the dark factory of a cruel man named Marcello. Momo's only friend, a quirky clown named Frac, aids him, while also falling in love with the singer of a circus named Giulietta passing through town. The children turn against Marcello (who is also known as the Dragon) by throwing rocks at him. The pair soon find their destinies increasingly entwined with that of the circus. The fluffy white rabbit is the only animal in the film and the songs "Let Love Live", "Child in His Eyes", "Love Leaves Someone Behind" and "Mountain of Clothes" are sung by Irène Marc. This film also features Elena Lev manipulating contortion and hula hoops in front of the middle of the great fountain and Alexander Dobrynin doing the bungee cords and the aerial cube inside the ruins. Cirque du Soleil released a DVD production of the show, Alegría. It was filmed in July, 2001, in Sydney, Australia. This production was directed and produced by Nick Morris. He used 14 cameras and special filming techniques to create a viewing experience that transports the viewer to the center of the performance. Alegría's tour history is quite extensive as it premiered in 1994. Since it began it has toured under the Grand Chapiteau as well as in sporting arenas. Additionally during 1999 and 2000 it played as a resident show in Biloxi's Beau Rivage. After 19 years of touring, Alegria performed for the last time in Antwerp, BE on December 29, 2013. Alegria has been to many different regions, here is the list of all of them. 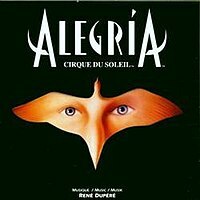 In commemoration of the show's 25th anniversary, Alegria is being re-premiered in its original Big Top format to pay tribute to the original state of the show. The tour will begin 18 April 2019 in Montreal. It will feature revamped costumes and makeup. It is being marketed as "Alegria: In a New Light" and will be re-directed by Daniel Ross. Other directives are yet to be announced. ^ "Cirque du Soleil - Press Room - Arena Shows - Alegría - About the show". www.cirquedusoleil.com. Archived from the original on 23 November 2009. Retrieved 29 October 2009. ^ a b c "Alegría Fiche Technique" (PDF). Cirque du Soleil (Press Kit). Archived from the original (PDF) on 2011-07-08. Retrieved 2011-02-15. ^ "Alegría: Characters". Cirque du Soleil (Press Kit). Archived from the original on 2011-01-02. Retrieved 2011-02-15. ^ "Alegría: Acts". Cirque du Soleil (Press Kit). Archived from the original on 2011-01-02. Retrieved 2011-02-15. ^ "Alegría Acts". Cirque Tribune. Retrieved 2011-02-15. ^ Clément, Ronald (2009). Cirque du Soleil 25 Years of Costumes (in Chinese, French, and Japanese). Canada: Dépôt légal, Bibliothèque et Archives Canada. pp. 34–39. ISBN 978-2-9803493-4-8. ^ RobbiFinkel. "Robbi Finkel's website". Retrieved 2008-01-19. ^ "Music - Alegría - Official soundtrack". Cirque du Soleil. Archived from the original on 19 October 2007. Retrieved 28 October 2007. ^ "Music - Alegría". Cirque Tribune. Retrieved 2011-03-24. ^ "Alegría (1999) - IMDb". Internet Movie Database. Retrieved 2011-03-20. ^ "Cirque du Soleil: Alegria". Internet Movie Database. Retrieved 2011-03-20. ^ "Alegría DVD". Cirque du Soleil (Boutique). Retrieved 2011-03-20.